Continuing in the vein of autumnal beers from brewers with the word dog in their name, this time we turn to Flying Dog's Dogtoberfest. Flying Dog was started as a brewpub in 1990 in Aspen by two ranchers, George Stranahan and Richard McIntyre. The brewery is quite proud of its connections to gonzo journalist Hunter S. Thompson. Each of their labels is illustrated by none other than the good doctor's legendary illustrator, Ralph Steadman, and marketing materials prominently feature Thompson quotes. Some of their beers are even dedicated to and inspired by the man. As a huge HST fan, I think I might love this brewery already. 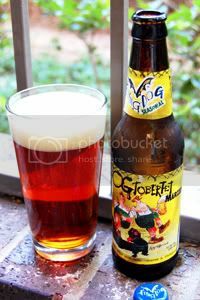 Dogtoberfest is a Märzen, or Oktoberfest, style beer. In the days before refrigeration, beer was not brewed during the summer. The last batch, brewed in March (German for March is Märzen), was allowed to slowly ferment over the summer months until late September. Oktoberfest (calling it Septemberfest would have been too obvious) marks the end of the off-season and is fueled by the now ready Märzen. Typically, these beers are malty, copper in color, and have a medium alcohol content. Appearance: Light copper body with amazing orange highlights and great clarity. The head pours about one and a half fingers high and is a brilliant creamy off-white. Eventually the head settles into a ring around the edge of the glass that leaves only soapy lacing that quickly recedes back onto the surface. Aroma: Caramel sweetness with a toasted malt body and a slight hint of hops. Somewhat thinner than I would have imagined. Taste: Balance of sweet toasted malt and floral hop bitterness with the caramel sweetness and some nuttiness in the back. Like the nose, the taste is a lot thinner than I was anticipating. The flavors themselves are nice, although perhaps a little too bitter at times, but the problem is I'm just not getting enough of them. Mouthfeel: Somewhat watery body with a good amount of carbonation. The aftertaste is pleasantly dry and bitter and certainly more intense than the rest of the beer would lead you to expect. Drinkability: With the thin body, this beer is quite drinkable, though perhaps a bit boring. Verdict: While the fundamentals of this beer seem strong (I got this line from John McCain), it's just too thin to really inspire me. If they really cranked up the malt on this beer, closer to what you'd expect in a Märzen, I think this beer would be a real winner. However, with the body as thin as it is this beer is simply an average Oktoberfest offering.